Zildjian's monster Drummer Love talent search is open and offering a ton of phenomenal prizes, including Zildjian cymbals, a photo shoot with ace snapper Robert Downs and a Rhythm subscription. 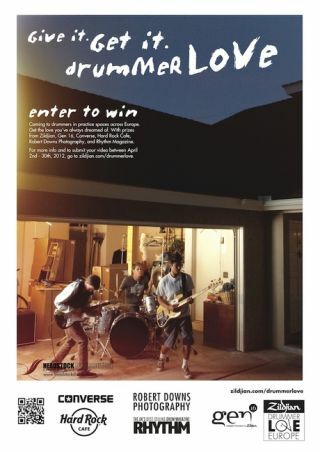 You now have until 14 May to get to Zildjian.com/drummerlove and submit a video showing off your chops and explaining why you'd love to play Zildjian. Star judges such as Gavin Harrison, Manu Katche and Simon Phillips will then help Zildjian gather a shortlist together, before your votes help crown six winners from around Europe. For full details on the competition and the haul of prizes you could win head here.